Short movie by Aixalà and Marcel.lí about the adventures of a shepherd from Navarre who wants to go to the Moon. 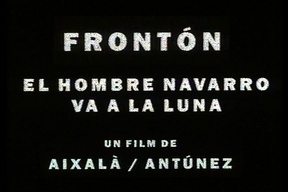 Frontón, a shepherd from Navarre, tries to reach the Moon. His journey takes him through strange and dreamlike places. On his wanderings he meets a woman called Lax who dominates him psychically and sexually. Plo, a naive shepherdess completes the love triangle. In the end, Fronton reaches the moon by being born from the body of his new mother, Lax. Fronton is 20 minutes long and was shot in 35mm. It was filmed in Navarre in December 1992 after extensive fieldwork in the area. The project originally came about thanks to a grant from the Department of Culture of the Navarre local government. It was awarded to the team made up of Ana Zabalegui, Dani Nicolay and Marcel.lÌ for a documentary project. However, the creative process transformed the original content of the project into a narrative fiction. This relates a series of conflicting situations confronting the local Navarre traditions with the hedonism of the femme fatale Lax. The film was not very well received by the Department of Culture of Navarre, which explains the absence of their logo in the credits for the producers. The film was shown in many festivals and it won the main award in the Festival Etrange in Paris 1993. The film was published in a compilation in France by L'Etrange Festival&Malta under the title "10 ans d'Ètranges courts metrages". Actors: Caterina Solivellas, Pau Nubiola, Carol Veranos y Iñaki Perurena. Produced by J.M. Aixalà, M. Antúnez, Pepo Sol, AZ Producciones & Ovideo.